News on exhibitions and events, with reviews and reflections on fashion, contemporary craft and design and opportunities around London for designer-makers of leather fashion accessories. The next Alexander McQueen? It’s (nearly) Showtime! There’s been a distinct and lively buzz in the back alleys around Farringdon this week, with folk in natty glasses and interestingly-coloured attire sporting distinctive bright pink lanyards, which can mean only one thing - Clerkenwell Design Week in full swing! This fixture on the interiors and product design calendar - so much more than furniture, lighting, carpets - is always a signal that a round of summer exhibitions is about to kick off, and another clutch of eager, spectacularly talented folk are going to be hunting for their first jobs in the design world. Graduate artists, designers and creatives of all shades are getting ready to peel off the masking tape, don their best (home-made, natch!) frocks and show the world what they are made of - yes, it’s Graduate Fashion Week from 3 June. This is a great time of year to catch up on the zeitgeist, get a feel for new trends and directions, and try to spot the stars of the future - even bag a future classic, as Isabella Blow did in 1992 buying the whole of Alexander McQueen’s MA collection. London Craft Week kicks off on 9 May – the same week as our first class in our elegant new venue, the Georgian town house that is home to the Art Workers’ Guild in Bloomsbury Square, London. Check out the guide for a plethora of exhibitions, demonstrations and events celebrating the wealth of making talent in the capital and beyond. Our highlights include AMAZING CHINA: An Exhibition of Chinese Arts & Crafts at The Hospital Club, and an evening talk, Makers’ Stories – Live at our old alma mater Cockpit Arts, a stone’s throw from the Guild. If you haven’t visited already, make a bee-line for Fashioned from Nature, the important new exhibition at the V and A Museum – and a subject close to our heart. This show highlights the close connection between natural materials and the evolution of fashion over three centuries, with a fabulous survey of new sustainable directions in the upstairs gallery, addressing the damaging effects of fashion on the planet. Choosing to open in Fashion Revolution week couldn’t be more apt. If you are not based in London, or fancy a trip out of town, this week also sees the famous SIT Select trail in the delicious textile-heaven of Stroud, Gloucestershire. Here you can visit Open Studios, and see experimental textiles in the making. Don't forget to drop in on the inspiring Atelier Stroud - a hub of sociable creativity - while you are there! As 2017 slides to it’s close, Designer Courses is planning for a brighter New Year, and branching out with two new locations for 2018. December marks the start of this fresh direction, with the first weekend at our new venue in the heart of Hoxton’s creative quarter, and a new programme of short courses to match. We will be in residence at The Archivist for our regular weekend ‘masterclasses’, hosting a series of sociable Sunday taster sessions, and we have some new evening courses to talk about, too. 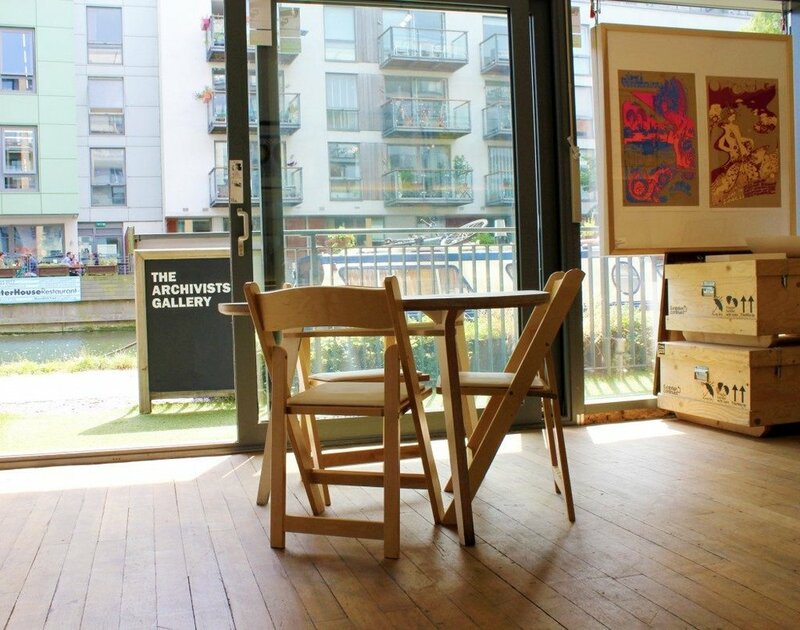 The Archivist’s Gallery is a creative mixture of gallery, shop and space for events, with a bar/café right next door. Just three minutes from Haggerston Overground or a stroll down the canal path from Shoreditch Park, Kingsland Road or London Fields, in a bright canal-side location with a constant buzz of artistic traffic. We are looking forward to contributing our mellow craft vibe to this creative mix! Click here the full list of courses at The Archivist. From May 2018 we will also be running a series of short courses at The Artworkers Guild in Queen Square, Bloomsbury. This moves takes us back to our old stamping ground around Holborn and Russell Square. Designer Courses began life back in 2005 when founder Katherine Pogson was based at Cockpit Arts, Holborn. Though her studio has moved on, she still retains many links with Cockpit Arts, through mentoring young design businesses connected to The Prince’s Trust, collaborating with creative colleagues and exhibiting at events such as the Winter Open studios and London Craft Week. The programme at Queen Square will include glove-making, decorative and couture leather techniques including gilding and embroidery, alongside a Summer School and evening courses for Autumn/Winter. Look out for the full schedule in our December newsletter, or email us for a sneak preview of dates! 4 May - Save the date! Join Designer Courses founder Katherine Pogson for a one-day symposium “Craft in Context’ in Covent Garden during London Craft Week 2017. Expect lively debate on the future of craft including luxury, sustainability, activism and more - for those at any stage of their career. Since setting up her independent design studio in 2000 at Cockpit Arts, the craft-focused design incubator in Holborn, London, designer-maker and founder of Designer Courses, Katherine Pogson, has seen many cycles, trends and business models at work in the arena of contemporary craft. In 2015, Katherine began researching this interest as a PhD candidate based in the Centre for Sustainable Fashion at University of the Arts London with a particular focus on the potential on handmade objects to create dialogues about relating to the natural world. The role of craft - satisfaction in making, ethical attitudes to materials and exploration of the relationship between humans, technology and the environment, have become universal themes in the new Anthropocene era, and these themes among many more, will be the subject of lively discussion at this one-day Symposium to be held at The City Literary Institute in Covent Garden, during London Craft Week 2017. Over the last few years I have worked with many people on the early stages of conceiving, developing and launching a fashion accessories brand. There is no right way to do this - but there are some common threads and some key decisions along the way which I thought I would share with you. As our recent case study about exciting new fashion handbag brand Paradise Row makes clear, there are so many roles involved in launching a brand, it is good to know which bits you don’t want to do, and practice the art of delegating as soon as you can! Design: It all starts here. Whether you are a stylist, have a ‘concept’ or are a maker at heart, the first stage is always to really invest in your designs. Map them, develop them, take them further. Test them out. Not everyone is a natural three-dimensional pattern cutter, and not everyone can draw professionally - what matters is not where you fall on this spectrum, but recognising your strengths and weaknesses and finding strategies to effectively communicate your ideas. Market research: This never stops! Look, look and look again. Analyse, compare, ask cheeky questions. How do other people do it, how does the market break down? Who, really are your competitors? Are you sure? What are your outlets likely to be? The same goes for materials sourcing and costing (beware the ‘fantasy cashflow' forecast…) This part can be addictive and fun, as you gather more inside knowledge and your confidence grows. Timing: Accessories brands have different rhythms depending on whether they are high fashion, ‘lifestyle’ or classic/iconic, but you must be in tune with the seasonal cycles in order to maximise sales. Prototyping and sampling are not the same thing! Once a design has been developed and tested - both ‘market’ tested and ‘stress’ tested - tweaked, adjusted, (hurled around the room…) you will need to co-ordinate samples, photoshoots, manufacture and delivery deadlines so that they dovetail in time for your launch. Manufacture: Ah, yes! If only there were a simple way to describe this process, in the U.K at any rate. Preparation is key - be ready. A manufacturer wants a client who is in a position to supply repeat steady business. If you have done your homework, developed your ideas and your business plan in tandem, and are ready to hit the ground running, then…a whole other journey begins! Whatever stage you are at, if you would like to chat through some ideas or get some specific technical help, do get in touch for a one-to-one consultation. We are familiar with shoes and saddles (and the occasional superhero costume) but did you know that moulded leather has been used, in its time, to make objects as diverse as horse armour, fireman’s helmets, wine bottles, cups and theatrical masks? In 1908 a fascinating leather shield moulded from a single piece of ox hide was found in Clonbrin, Ireland. This beautiful object was formed by stretching over a carved wooden mould, and has been dated to the Bronze Age, 13th Century BC. It may not appear to be the accessory-du-jour, but this is the kind of object that inspired me to research the mouldable properties of leather at the Royal College of Art, nearly twenty years ago! Why did we not exploit this wonderful sculptural property more, I wondered? These days, with a revival of interest in craft and couture techniques, and the possibilities of uniqueness they can impart to precious objects, moulded leather is once again riding high in fashion. Statement clutch bags, Game of Thrones-inspired headgear and costume jewellery, and minimalist household products have all been produced using this ancient art, helped by technologies such as 3D printing and CNC milling, which make complex mould-making faster and more affordable. The technology required is so simple - leather, water, a shape or former, and some elbow grease! (And a few clamps and staples don’t go amiss). Of course, you have to choose the right kind of leather: vegetable-tanned hide. The tree-bark (traditionally oak) which preserves the leather gives it some of the strength of wood when dry, but allows it to become elastic with possibilities when wet - it can stretch to take on permanent form, and pick up the most detailed surface impression, texture or pattern. Our Leather Moulding Weekend course not only shows you how to design and make a moulded leather bag, box or other product, but also introduces some intriguing ways to make your own moulds quickly and cheaply, using lateral thinking and a lo-fi approach. Interview with Mark Lightfoot, owner of Cavesson’s London, Luxury Leather Goods. Mark worked with Katherine Pogson on an intensive tailored training programme in February 2015, and launched his luxury leathergoods company earlier this year. How did you come to the idea of setting up Cavesson’s? About 2 years ago I happened to be travelling through Heathrow. I had on a leather belt and going through security I realised that I did not need to take it off - as I had a detachable metal buckle. It got me thinking about products for the business traveller; high quality, with a real design touch. You know how these things can snowball. The idea stuck in my mind, and I kept turning it over. I amassed a huge cache of data about travel retail, luxury leather goods production and history … in time I developed a business concept for an entire product range. I became obsessed with the idea, became obsessed with leather. What was your background before you started the company? I trained as a graphic designer, joined an advertising agency and then started my own design company at the end of 1997, but I did many different things at college enjoying anything that was hands-on. The computer changed all that. Yes, you can do amazing things with a Mac… but it doesn’t have a smell, it’s not tactile. It doesn’t give, or talk to you like materials do. There’s a far deeper connection, something spiritual, about working with physical materials. I’ve worked in design and visual communications all my life, so when it came to the idea for Cavesson’s, well I had all the communications and branding side of things covered as well as a lot of business experience. How did you come across Designer Courses? Google! I was looking for someone I could work with to learn more about leather. I emailed, got a lovely response and it frankly just felt right. There were quite a few results in the Google search but Designer Courses looked special - I liked the simplicity of the website for one and Katherine sounded lovely. The one-to-one was a big attraction too. What was it about Designer Courses that appealed to you? The communication. From the first email contact it was clear I was dealing with someone professional. I liked the location too and I loved the pictures that I found online of the studio. It was conveniently located close to the tube. As far as my course was concerned, everything felt completely trustworthy. I was applying for a EU grant and had to supply all sorts of documentation! Katherine was exceedingly helpful. How did you find the process of working one to one with Katherine? This was really good. I was only able to do 3 days, so it was very intense. We had prepared the lesson plan over email, so we hit the ground running. I came with a lot of background reading done, and lots of questions. I immediately warmed to Katherine, and felt extremely at ease. She is a great teacher and the environment in the studio is conducive. We had developed a bespoke program through discussion beforehand and I was very clear about what I wanted. I love working alone generally but I also love the collaboration and discussion that design needs. Time to think, time to share. We discussed influences and ideas. An easy back and forth that made the process of learning and teaching very fluid. I was enthusiastic, and I felt Katherine to be likewise. What was the format of your sessions - how, where did they take place? We did studio work, looking at tools, materials, stitching and threads. I got hands on with saddle stitching and punches, we played with the materials, in effect allowing me to discover how leather felt in the hand, how it gives when you stitch, the different types of leather suited to different requirements. I had brought of set of production samples with me from a prospective manufacturer - we decided that we would deconstruct one of the pieces as a starting point for the training. We began by sketching out a rough pattern, measuring, and drawing up an outline. This was refined into a working pattern. I had to take into account the thickness of the leather, how it folded, how the lining would be combined, the sequence of construction; it was a puzzle! There’s a proper leather sewing machine in the studio and I got to use this too. It’s impossible initially but after a while I got the hang of it. I had asked Katherine if we could visit some of the associated trades in London, so we went to see Walter Reginald - I remember heaving shelves and the rich aroma of leather - and the most extraordinary selection of garish patterned leather amongst what seemed like rare treasure, the bridle and calf from some of the finest tanneries in Europe. We also visited a small leather workshop with all the machines you could imagine stuffed into a space about the size of a 2 car garage. I was taken to see a fittings supplier in the East End, and it was all shiny buckles and clasps, full of fashion students buying PVC and plastic, Christopher-Bailey-studs and chains! We made time for lunch each day and that was a great counterpoint to the lessons. We ate well - there’s some lovely cafes in the area around Livingstone Studios. We also made time to walk around Sloane Street and then Mayfair, looking at some of the luxury leather goods stores. We lingered in Delvaux, Hermes, YSL… to get a sense of what was possible with leather in the sort of market I was aiming for. I had been around these stores many times before, but this time it was with a new point of view, it made me look at the various products in a new way - with a more critical eye. What were you specifically hoping to learn from the experience? I wanted an introduction to the world of leather. I wanted to work with it, understand from someone who’s life it was - to find a way in. There’s so many facets to leatherwork, I wanted to explore the potential. I was so excited and enthusiastic that it was great to have someone to share it with, and to have mentor me for a few days. Did anything surprise you about the process - lead you in a new direction? Definitely in regards to who I was manufacturing with, the design of my collection, the pieces, the target audience. Katherine asked lots of questions and challenged me to think more clearly, with more focus. I had just landed my angel funding so I knew that I was going to be working towards my goal of launching Cavesson’s, and this fact gave the course a very real focus. I think the biggest surprise was the design concepts I had previously worked on - they went out of the window! If I think about my first collection drafts, and what I launched with - that new direction, that came with help from Katherine. How would you describe the teaching style? Katherine’s teaching style is collaborative, and educative in the best possible way. She helped to draw out my natural skill and allowed me to see how I could use that. She made me aware of new things, helped me ask questions about my project, encouraged introspection, and also challenged me about some of my assumptions. Our very own Katherine Pogson will be giving a free talk about her new work (a collision of anthropology and lepidoptery - anthrodoptery?) at 4.30pm on Friday 29 April at Made London: Bloomsbury. This is a pared down, table-top selling event, showcasing over 100 exceptional makers across all media in a beautiful and characterful setting. Mary Ward House, 5-7 Tavistock Place, WC1H 9SN. 29 April - 1 May. The fabulous and funky Institute of Making has its next public event on Thursday 28 April, 6:30pm - 8:00pm. Learn how to make your own Pigments, Paints and Prints. These always book out within minutes, so be ready! Booking opens April 7 at 7pm. The “shape-shifting nature of the light on the hills.” How the silversmithing and jewellery work of Pamela Rawnsley reflects the Welsh landscape in all its moods. Curator talk with object-handling. The Goldsmith’s Centre, 42 Britton Street, London EC1M 5AD. 7 April. Poly Pigment showcases playful embroidered textiles and whimsical concrete jewellery by emerging designers Rhiannon Palmer and Zuzana Lalikova. London Craft Week - a bewilderingly rich array of exhibitions, demonstrations, workshop tours, films and talks - spanning jewellery, fashion, product design, textiles and luxury goods - all under the contested title of ‘craft’. Workshop highlights: kinetic sculpture, concrete-making and painting Persian miniatures. In a rainy and cold week, London seemed to have a case of the blues with strong turquoise, cobalt and aqua prominent among the off-stage accessories sported by the fashionistas and blogging wannabes posing outside venues. Colour blocking is still a big story, with our very own Anya Hindmarch giving it a new flick of the wrist with a clever, Rubik’s cube inspired collection featuring panels of coloured squares in homage to the retro puzzle. The humorous, statement bag was further mined at Sophia Webster with speech-bubble shaped clutches sporting wise-cracks such as “To die for” and “Talk is cheap”. Structured bags and boxy over-sized totes continue to dominate some collections, opening the show in blush and black at Christopher Kane. We warmed to the home-spun, punky feel of newcomer Carianne Moore’s bowlers and backpacks with crackle-paint and over-stitched edges - a DIY aesthetic that chimes well with the Designer Course ethos (see the Leather Fashion Accessories weekend). The showcase from the latest clutch of MA graduates at LCF Fashion Artefact is usually a strong showing of artisan ingenuity and leather-love. Our favourites this year were Thais Cipoletta with her articulated spine-like strap structures and immaculate hand-stitching, and the delicate copper and artex colour story by Gaia Marcattilj - check out the whole crop at Showtime. Katherine Pogson shares her story about how she first became interested in hand-making leather gloves. The first pair of gloves I ever tried to make were mint green, butter soft, embroidered - what was I thinking? Back story: I lost one of my favourite leather gloves. Emerald green leather, silk lined, Italian. A burst of intense colour, but also a flattering fit - slim on the wrist, elongating the hand, reaching generously up the arm without suggesting gauntlet - I was in love. I walked back for a full hour through the city streets retracing my steps, finding at least four forlorn single gloves, but not mine, not mine. As someone who had worked with leather for over a decade, I thought I would rise to the challenge - how hard could it be? I set to with my unpicker, stretched and traced round all the pieces (eight in total) of the remaining glove, calibrated my sewing machine to what looked like the stitch used, and...little did I know I was of on a journey of discovery that would still fascinate me five years later. It was hot in the studio. I perspired. The natural oils in my hands began to stain the pale leather as I worked in the heat. Already, I was in new territory, learning, exploring, discovering a completely different aspect and quality to this material that I thought I knew. Which part of the skin should I choose for the palm, and how do you deal with the unpredictable stretch? What is that diamond-shaped piece between the finger for? How do you control the sewing machine in such a tight space as round the thumb? I began to research. I found some wonderful books in second hand shops, and sought out hand stitched gloves in charity shops and vintage fairs. By coincidence, one of the last remaining glove factories in Britain happened to be in the town where my parents live. I had always dismissed it as an unpromising, golf-sale sort of place, but now I came to realise that, inside that modest set of buildings, wonderful things were going on. Parcels were being sent of to Barney’s New York, to Japan. Centuries of tradition, expertise and the kind of hands-on, tacit knowledge that is so difficult to communicate except by doing, was stored up, and possibly, dying out. It took me a while to persuade them to let me come in and watch on a regular basis. “It takes five years just to learn how to stretch the leather” they told me. Repeatedly. Eventually, generously, they let me come and watch Reg doing his magical thing with the stretch and the weird shaped ruler, Eileen patiently and effortlessly showing me how she hand stitches a glove in what seems like minutes. I first made a glove for my right hand (I’m left handed, so I can adjust the right hand better). It split across the palm when I put my hand in. That was before I met Reg. I made another. I must have made about seven right hands before I felt it was worth making a pair. Learning by doing - it’s the best way...and by working with other people, other hands, passing on what I have learned so far, I have come to seriously love this almost forgotten craft.